Wouldn’t it be nice to have an unlimited budget for your kitchen remodel project? The ability to choose any tile, flooring, appliances, and layout to fit your lifestyle would be magnificent. Unfortunately, most homeowners do not have an unlimited budget. In fact, the budget tends to be a huge barrier when it comes to achieving the vision of most home remodeling projects. You’re not alone if your budget is the barrier between you and your dream kitchen. 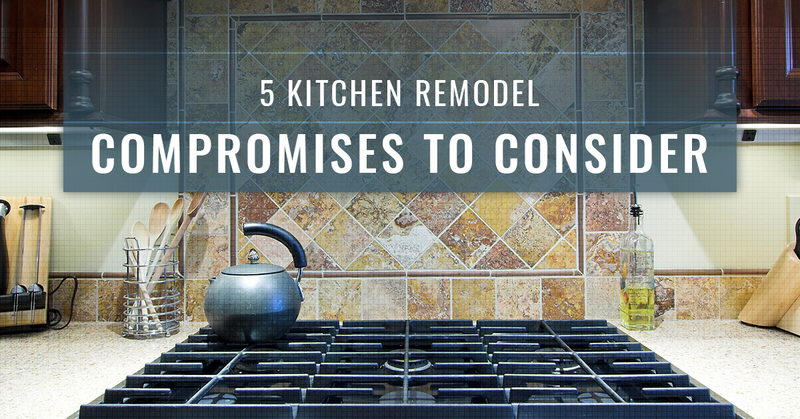 In fact, this article shares the five compromises you can make during your kitchen remodel project so that you get what you want without spending thousands of dollars over budget. One of the biggest questions you must answer during a kitchen remodel is this: How do you choose between so many different types of remodeling options? As you read this blog, you will discover that you do not have to make as many tough decisions as you thought. Start with the function of your kitchen. How will it be used? If you can determine the answer to this question first, you can dial back your expenditures exponentially. However, if you answer with “a little bit of everything,” you need to seriously consider choosing one or two functions, not twelve — especially if your budget doesn’t allow for an all-purpose kitchen. If you’re a social person, you may use your kitchen more for gatherings and events. But for most Americans, you use your kitchen for daily endeavors like eating, cooking, and preparing all of your food. You will want to ask yourself: How will I be using my kitchen in 10 years? This one question will put your kitchen remodel into perspective. If you see yourself holding events more than 15 times per year, go with the social kitchen remodel. However, if you see yourself not holding events very often, you can stick with your standard remodel. What will your perfect kitchen cost and how much value does it bring? These two metrics will be different, depending on how you remodel your kitchen. Granted, your kitchen remodel may cost you $20,000-plus, but the value you get out of it is well within the six figures over the next 10 years. Understand that the cost your kitchen should not exceed the value it brings you, your family, or your guests. You may remodel your kitchen to look the best, but how does it function for you? Your kitchen is a functioning space — or at least it should be. Remodel your kitchen to achieve functions, not look great. The great part about kitchen remodels is that you can have a beautiful space without sacrificing function, even though this may cost you more — and the value the kitchen brings you will go up with this choice of both. How efficiently can you prepare a meal? How far away are your primary appliances from one another? The “triangle” in the kitchen consists of your sink, stove, and fridge. These are the three most used features in any kitchen. If they are spread out across your kitchen, your speed will be slow. If they are relatively close in a corner or a section, your speed will increase. It can be tough to remodel a kitchen and seriously consider the real you vs. the ideal you. What do you dream of having vs. what you actually need? This can be a tough conversation to have with your partner or even yourself. How do you actually use the kitchen vs. how you dream of using the kitchen. Consider the cost of the dream-use kitchen vs. the functional kitchen. You will probably get more value out of the functional kitchen compared to the dream kitchen. Need tile for your kitchen remodeling project? Visit the Transworld Tile showroom today or give us a call now to find the perfect tile.